NetEnt’s most successful slot in its 20-year history. Played 1.5x more than the iconic Starburst in the first 30 days since release. During that time it triggered 2.5x greater game win than the next most successful branded game ever. It’s the first in the NetEnt Rocks series, along with Jimi Hendrix and Motörhead. 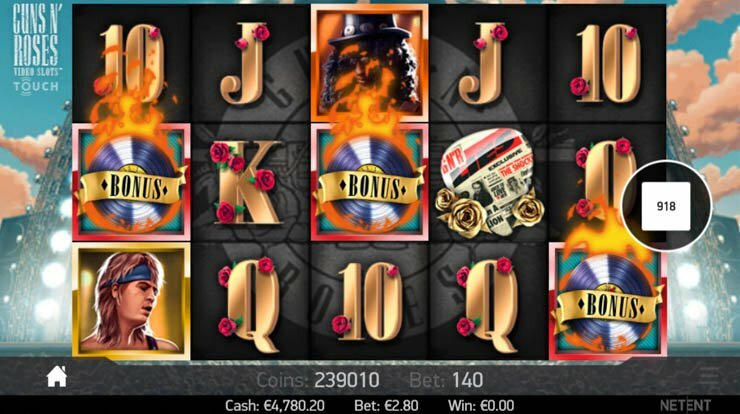 It’s the 20-line Guns N Roses slot and it has 5 Grammy-grade bonuses approved by Axl Rose and Slash themselves. 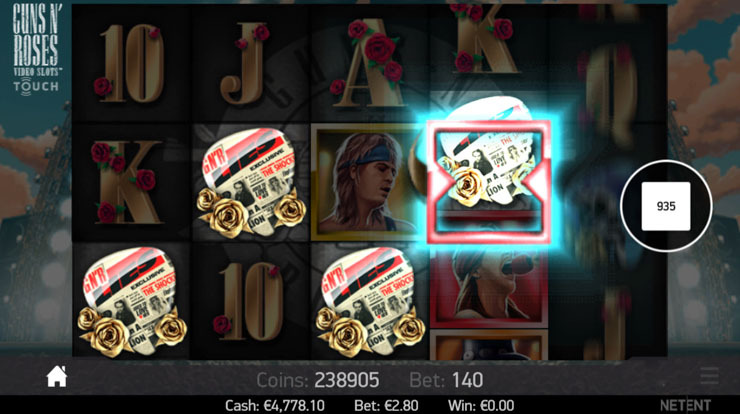 🔥 Try the game: Play Guns N’ Roses now at Metal Casino. As the winner of the EGR Game of the Year 2016 award, here are the 6 formulas for success of the Guns N’ Roses Video Slots™. Featuring Stacked Wilds + 3 random features. 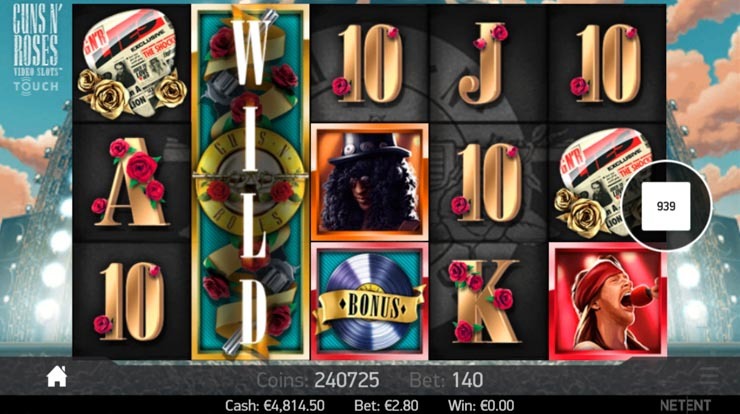 One of the beauties of the Guns N’ Roses mobile slot is that the base game is just as powerful as the bonuses. One of the ways this is achieved is with the Expanding Wilds, which can appear anywhere on the screen and substitute for the highest possible winning combo. Not only that, but you can win up to 3 completely random slot features during normal play too. 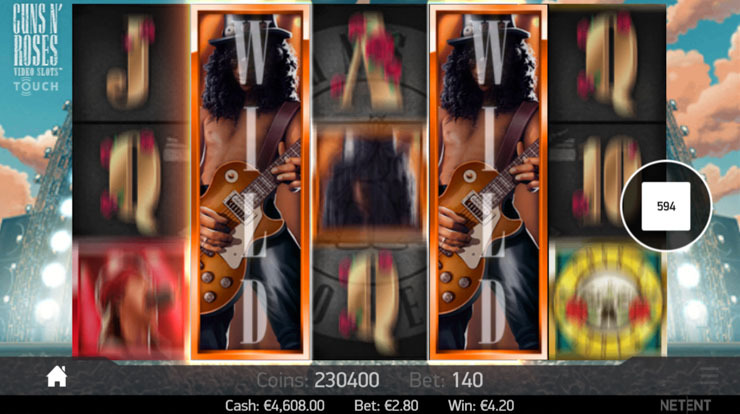 They are as follows: The Appetite for Destruction Wild, Legend Spins and Solo Multiplier. For comparison, the Motörhead slot and Jimi Hendrix have 2 random features in the base game each. They are all quite original, so let’s see how they work one by one. Land The Appetite for Destruction Wild in the middle for epic wins. It’s a massive cross-shaped Wild symbol that covers 5 symbol positions. When the feature becomes active, the Appetite for Destruction Wild starts spinning to land anywhere on the 3 middle reels (reels 2, 3 and 4), in full or half view. And when it does, the standard Expanding Wild symbols can also appear as normal for even crazier returns. GNR slot’s Legend Spins feature 3 re-spins with guaranteed Expanded Wilds. The Legend Spins will leave you in suspense for 3 special spins. Each round comes with at least one guaranteed Stacked Wild in the form of a band member. Legend Spin #3 – stacked Slash on reels 2 and 4. Although you won’t win for sure, the chances that you will hit a BIG win are in our favour. 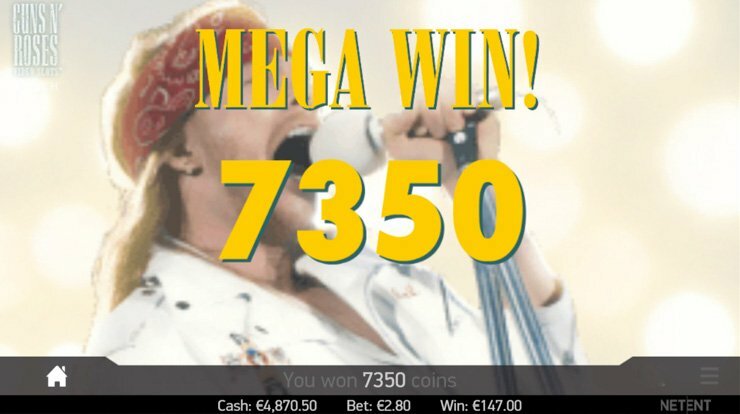 Guns N’ Roses Solo Multiplier for up to 10x bigger wins. And there’s only one way to activate the Solo Multiplier – you need at least 3 matching symbols on any of the 20 active lines. This can include Wilds. The Solo Multiplier will then kick in on reel 4, and the longer it keeps spinning, the higher the magnifier goes. You can win anywhere from 4x to 10x, and not only for that line but the entire win. You simply cannot lose in this one. Okay, so what about the rest of the bonuses? Land 3 Scatters to win Bonus Wheel feature and more bonuses. Having covered the 3 random features, it’s time to review the rock game’s big guns. As it starts spinning, your task is to push the Stop button and hope for the best. In this case, you’re guaranteed to win one of the 3 GNR bonuses: 1) up to 4,200 in coins 2) Crowd Pleaser feature 3) Encore Free Spins bonus. By the way, Jimi Hendrix Video Slot™ has a similar Pick and Click feature, with 3 Free Spin bonuses up for grabs. That said, here’s what the last two Guns N Roses bonuses are all about in more detail. 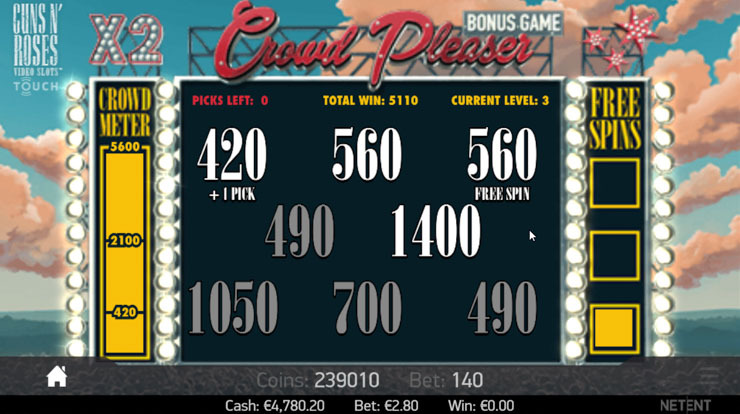 Crowd Pleaser pick and win feature for coin wins and Free Spins bonus. To make it clear from the start, this is not an ordinary picking feature. All you have to do is please the crowd by selecting guitars, drums, whistles, mics and other musical instruments for coin wins and a second chance to win the Encore Free Spins feature. You start at Level 1 and have 3 picks. Your task is to collect enough coins to progress to Level 2. There you’ll have 3 more picks and a coin level that you need to reach to progress to Level 3. Also keep in mind that the minimum coin win increases as you progress. Finally, reaching the top of the Crowd Meter in Level 3 doubles the total win for the feature. As you make your random selections, you can also reveal +1 Pick symbols and win a maximum of 1 Free Spin symbol in each level. So only if you reach Level 3 can you win the almighty Encore Free Spins. With that in mind, let’s see what the Guns N’ Roses Free Spins have in store for you next. 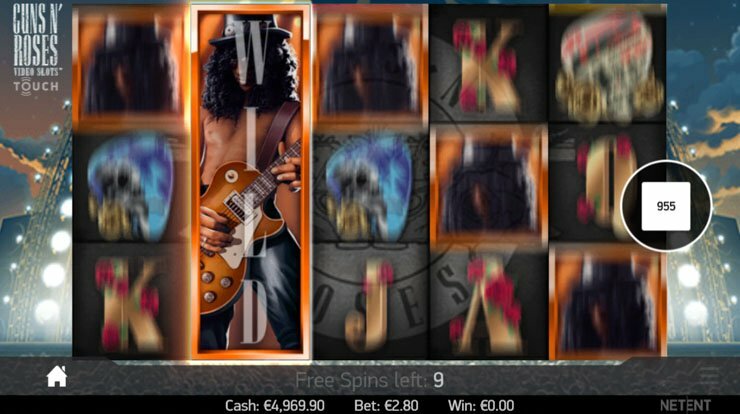 Guns N Roses Free Spins bonus with Expanded Wilds on each spin. Whether you trigger this feature during the Crowd Pleaser pick-and-win bonus or the Bonus Wheel it doesn’t matter. The GNR Free Spins feature starts with 10 rounds. To make the spins more valuable than in the base game, NetEnt has added boosted Stacked Wilds that appear on every spin on reels 2, 3 or 4. These aren’t regular Wilds but one of the band superstars. It’s important because the corresponding band member will also act as an extra Wild on all other reels for the spin. 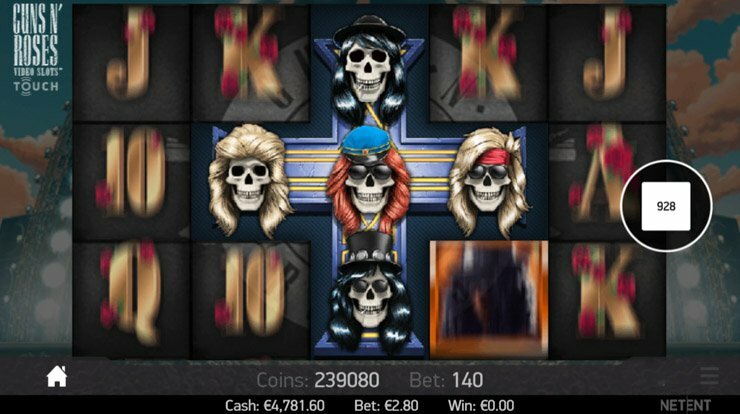 Speaking of the Guns N’ Roses members – Axl Rose, Slash and Duff McKagan – they are obviously the highest paying regular symbols in the Guns N’ Roses slot. And the most you can get for each one is 750, 500 and 300 coins, respectively. As you can assume, there’s no way to re-trigger the bonus; but more often than not it should be entertaining enough to do the job. Similar Free Spins can also be found in the 3rd NetEnt Rocks slot Motörhead, with lots of stacked Snaggletooth Wilds that produce “Overkill!” wins. However, Jimi Hendrix has not one or two but three Free Spin features that dwarf the above-mentioned. See the full review with images. Click to play Guns N’ Roses for free and don’t regret doing so later. Released on 21st January 2016, the NetEnt powered Guns N’ Roses turned out to be the most successful game ever released by the company. The Appetite for Destruction Wild – 1 of 3 randomly triggered features with the mother of all Wild symbols. Legend Spins – 2 of 3 random features with 3 re-spins and 5 Stacked Wilds that make the crowd go nuts. Solo Multiplier – 3 of 3 random GNR features, where you can win anywhere between 4x and 10x the total stake, guaranteed. Bonus Wheel – land 3 Scatters to win 1 of 2 more bonuses or a generous coin prize. Crowd Pleaser Feature – pick musical instruments to entertain the crowd for guaranteed coin prizes and a chance to win a free spins bonus. Encore Free Spins – 10 rounds of bliss with guaranteed Expanded Wilds and additional Wild symbols. What’s the point of all that if you don’t give it a try for yourself? Play Guns N’ Roses slot for free or real money at top casinos like Rizk, Casumo and Mobil6000. Feel free to mix it up with the other two rock band masterpieces: Jimi Hendrix and Motörhead.